Many of my friends get nauseated simply looking at the looping roller coasters that snake through many amusement parks these days. So, what do I tell people who want to have fun at an amusement park but don’t know what to ride? 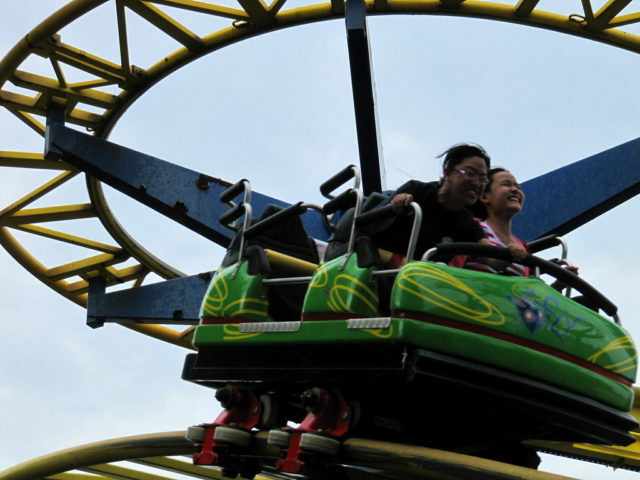 Go ride a Wild Mouse roller coaster! A classic roller coaster that is truly in a class all to itself, Wild Mouse roller coasters bridge the gap between the so-called kiddie roller coasters found in the children’s area of many theme parks and the high-flying thrill machines that are plastered on theme park brochures at the travel agency. Wild Mouse roller coasters, also called Wildemous, Mad Mouse, Magic Mouse, Rat Run, or Crazy Mouse roller coasters, are found at theme parks all throughout the United States and are perfect for riders of any age. Whether you are a seasoned veteran, young rider, looking for something you can ride with your whole family, or trying to find something fun to do at an amusement park with a ride-reluctant significant other, you’ll be sure to enjoy riding roller coasters such as the Wild Mouse. There are many Wild Mouse coasters throughout the United States. In fact, nearly every good amusement park has one. Even Disney World (more on this later) has a version of the Wild Mouse roller coaster. So, what makes the Wild Mouse roller coaster special, and where can you find some in the United States? Read on! Wild Mouse roller coasters first gained popularity at fairs and carnivals in the 1960s. During the 1970s, Wild Mouse roller coasters began to lose popularity as larger rides began dominating fairgrounds and amusement parks. Boasting a compact footprint and providing thrills for a variety of riders, the Wild Mouse found a new niche in the 1980s and 1990s among parks trying to boost their roller coaster counts. Something that makes Wild Mouse coasters unique among all types of roller coasters is that while they may lack the steep drops and upside-down elements of larger roller coasters, they still are incredibly thrilling. Their quintessential hairpin turns and unbanked corners lend to the sensation that you will fly off the side of the track as you careen through the ride. These classic roller coasters also make a decent compromise if you or a friend are afraid of heights, since most Wild Mouse roller coasters are less than 50 feet tall. And, with track lengths usually under 2,000 feet, the ride is typically over in less than 90 seconds. Wild Mouse coasters also have cars that run independently (they are not attached, train style, like other types of coasters), and each car seats up to only four people, so a ride with your family or friends can be a fun, highly personal experience. And, don’t forget, there are several traveling Wild Mouse roller coasters. Perhaps one may appear at your local fair or carnival!